The Capture of St Lucia. On 13th March 1778 France recognised the independence of the United States of America, and thus Great Britain and France were at war again. The 28th Foot, together with the 4th, 5th, 15th, 27th, 35th, 40th, 46th, 49th and 50th Regiments, plus fifty Light Dragoons, embarked at Staten Island in New York, bound for the West Indies. 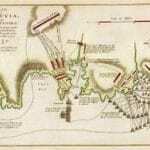 In a skilfully executed combined operation, the Royal Navy and the Army captured the island of St Lucia in December 1778. Admiral Barrington’s squadron of twelve warships covered the landing of 6.000 men from as many as fifty seven transport ships under Major-General Grant who overwhelmed the island’s tiny garrison with ease. However it wasn’t long before a French fleet hove in sight, twice as large as Barrington’s, and escorting its own landing force, double in numbers that of Major-General Grant’s force. Grant divided his force into three, manning the major strong points of the island. The first French attack fell upon La Vigie, where Lieutenant-Colonel Medows was posted with his three battalions, who were an interesting mix; the 5th Foot, the Grenadier battalion, and the Light battalion, the latter two composed of the elite flank companies of all the British infantry regiments (including the 28th) landed on St Lucia. The entire French force attacked but were finally driven back as the British reached the end of their ammunition supply. Successive French attack over the next several days on the two other British positions also met with failure. Within two weeks, the French had evacuated the island and St Lucia was in British hands. St Lucia changed hands no less than fourteen times between the French and the British between the 17th and 19th centuries, finally being ceded to the British in 1815, before the small island state attained independence in 1979. Picture: Contemporary map showing the dispositions of the British and French forces.